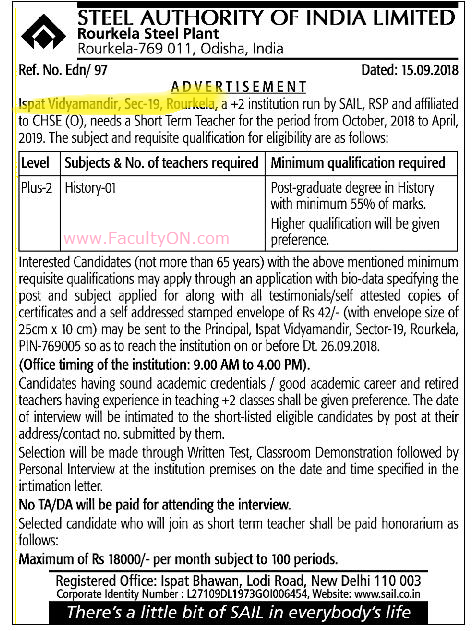 Ispat Vidyamandir, Rourkela has advertised in the SAMAJA newspaper for the recruitment of Teachers jobs vacancies. Interested and eligible job aspirants are requested to apply on or before 26th September 2018. Check out further more details below. PG in History with minimum 55% of marks. Higher qualifications will be given preference. How to Apply: Interested and eligible candidates are requested to send their CV giving details like name, post & category applied, qualification, address, contact number & email ID along with attested copies of certificates / mark sheets and a self addressed stamped (Rs.42) envelope (size 25 cm x 10 cm) to the postal address provided below through registered or speed post.